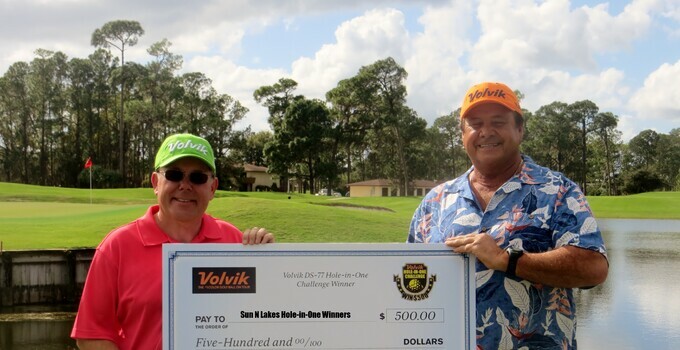 Here and there, we've been telling you about the Volvik DS-77 Hole-in-One Challenge, where you can win $500 if you make a verified ace using Volvik's DS-77 golf ball after pre-registering at their website. We've also told you that a couple of players at Sun 'N Lake Golf Club cashed in on the $500 prize with a pair of aces, including the first in the promotion. But, to this point, we haven't heard from the players themselves about their aces. Our friends at Highlands Today did speak with Sun N’ Lake regulars Joe Bowditch and Pat Dell to get their ace accounts. Here's Bowditch, who did it first. And this from Pat Dell.